Various online-platforms offer free and easy-to-use route calculation. Professional truck and vehicle routing, however, provides much more than that. Many specific requirements and challenges need to be taken into account when optimising routes for commercial vehicles: Truck attributes like size, weight and speed profiles, access restrictions in inner-city areas, toll costs, legal provisions like driving times and rest periods as well as time restrictions such as opening hours of ramps and depots are just a few examples. Additionally, the route with the shortest travel time may not be the fastest or most fuel-efficient route. All these factors turn route optimisation for trucks into a real challenge. In transport logistics, however, efficiency is key in ensuring profitability and sustainable business success. Therefore, it is crucial to ensure that commercial vehicles always take the optimal route available. Why plan routes with PTV xServer? The difference between freely available online tools and the routing optimisation components by PTV xServer lies in their ability to factor in all truck-related data and requirements: Since our founding four decades ago, we have accumulated abundant truck-specific data and acquired expert knowledge in optimising truck-specific routing. PTV xServer offers developer components that can be easily integrated into your existing system architecture and expands the routing capacities of your transport logistics software. The components are available as easy-to-use and integrable on-premise solution and as an even more powerful cloud-based web service for the most advanced use cases. Additionally, as developer, you benefit from abundant documentation as well as continuous support. Our Route Planning API allows you to customise vehicle profiles to your requirements or work with standard reference profiles. The standard reference profiles include continent-specific features like official weight classes in Europe, North America or Australia (EUR, NAM, AUS). Calculate exact toll costs based on vehicle attributes when planning routes and determine when toll-free routes are a viable alternative. Factor start or desired arrival times into your routing. Specify schedules and timespans for longer periods, such as roadworks, to be considered in your planning. Define waypoints on the road or off the road (e.g. buildings or facilities beside the road). Determine whether the distance between on- and off-road waypoints should be calculated as part of the route. 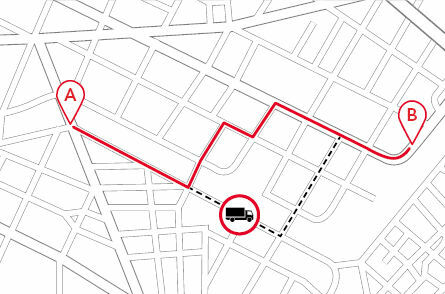 The PTV Route Planning API considers all relevant truck-specific attributes like length, height, weight, special cargo and access restrictions when calculating the optimum truck route. Additionally, it factors in live traffic information and traffic patterns to avoid congestion and circumvent bottlenecks. Calculate exact emissions based on vehicle attributes and recognised standards like CEN, HBEFA, CO2e, COPERT. Consider legal or your own set of rules regarding break and rest times and factor them into your route planning.